Whether you and your fiancé invite children to your wedding day or not has become a modern day dilemma. No matter how big or small your wedding celebrations are, there is always that ever so tricky question of whether or not to make it kid friendly. Unless you already have children, in which case they are bound to be a big part of your special day. There’s no doubt that children can be adorable and bring that extra sprinkle of magic to your big day. On the other hand they can also be unpredictable, loud and demanding. So, how do you make that ever important decision? We’re sorry to be completely useless and sound like your mum back in high school. But this decision can only be made by you. There is no right or wrong decision. The choice ultimately comes down to you and your partner’s personal preference. So, what are the pros of including children in your festivities? One of the most positive reasons of inviting children to your big day has to be the bringing together of all of your family. The “no kids” rule can lead to some of the most important people in your life not turning up. Whether it be them being awkward and not being able to find a babysitter. Another worry is the chaos children tend to bring with them. If you thought making the decision between cream or white napkins, whilst trying to entertain your fiancé was stressful. The thought of children throwing cake, eating the bouquet, and screaming throughout the vows is bound to push you over the edge. The reality is, there are very few parents who would sit back and let their children cause havoc, many parents will usually ensure that they bring enough distractions to keep their little ones quiet and entertained. Having children at your wedding doesn’t have to be a horror movie in the making. Sure, kids are 100% unpredictable. They scream, they make mess, they need constant attention. But they can also be surprisingly cute and add a lot of magic and un-forgettable moments to your special day. Deciding to not invite children can leave you feeling like a bit of a monster. With the rest of your family and friends silently judging you, wishing you trip over your dress before the alter. However, the reality is, your wedding day is exactly that – your wedding day. 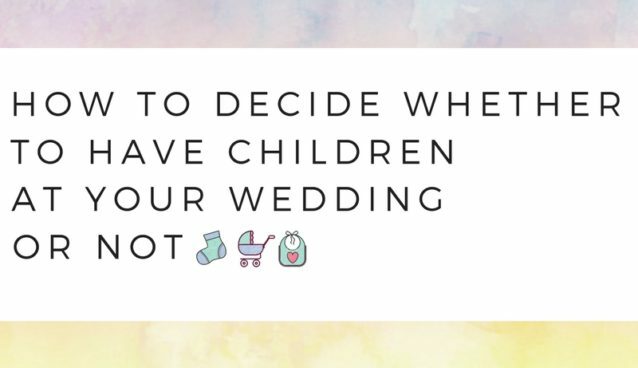 You have saved for months, maybe years for this day so if you decide you don’t want children attending, then you shouldn’t be made to feel like a bridezilla or a bad person. Besides the obvious reasons of having a lot of unwanted noise, chaos, and drama there are many other reasons to why couples chose to make it an adult only event. One of the main reasons being, they get that quality time with their friends and families. Without them having to leave early, or being forced to resist the tequila shots and bad dancing. Throwing in the “no kids” rule gives your loved ones the excuse of a night off without the guilt. Another plus side of having an adult only do is the cost. Inviting children can become costly as most children need their own seat, meal and all of the other little things such as favours and candy buffets. Even if you love children more than anything in the world, your bank card might not. Whatever you decide, make sure it’s crystal clear to your guests. If you decide on a child-free wedding its super important that you make it clear on your wedding stationery, you don’t want the job of telling Jen from Uni that her five children can’t go past the church gate on the day of your wedding. Parents tend to make assumptions about their children making the list, and rightly so if the wedding invitation doesn’t state otherwise. If you are inviting kids, adding the words “and family” to the invitationor the envelope will give your loved one the nod of approval that their little cherubs are welcome. Alternatively, if you aren’t including children simply address the invitation directly to “Mr & Mrs Smith”. More couples are opting for adult only weddings. And the most popular piece of advise from seems to be ensuring your guests have plenty of notice. It’s really important that your guests know in advance from the get go as this allows them to plan childcare, and even look forward to it. How to avoid offence to your guests if you decide on a child-free wedding. Sorry to break it to you, but there’s a high chance that you will have some offended unhappy parents when they find out their little one isn’t invited. On the other hand, some parents won’t be bothered and will appreciate the time off. Even though you shouldn’t have to justify your decision there are different ways of handling the situation. Carrying out a few little extra steps that won’t take you much time or effort, can really help to ease to blow. Little things such as maybe giving them a call and taking the time to explain that it’s nothing personal it’s just down to budget or, other personal reasons – whatever you’re comfortable telling them. Alternatively, you could add an extra insert or note card into the invitation with a nice poem or wording explaining that their little ones are special. You have agreed on no children at your wedding for a reason, so share this reason with your guests. You may end up making them feel the same way! After all, your wedding is a chance for them to relax, drink as many glasses bottles of wine as they want. What if you want to invite some children but not others? Maybe you don’t mind inviting your adorable baby nephew. But you’d rather be locked inside a lift for 3 days with your mother-in-law than invite your friends un-disciplined wild twins. It’s completely normal to feel like this. But it’s not really good etiquette to invite some children but not others. You could always be super sneaky and maybe make exceptions for children who are in the wedding party. If you do invite children, how on earth do you keep them entertained? It’s no secret that children get bored really easily. Particularly if they’re spending their day being told to “shh” and “sit down nicely”. As great as a magician or crèche sounds, it’s not always that easy or cost effective. Games, puzzles, colouring books, and other children wedding activities are all great ways to keep the little ones entertained and not at a high cost. It’s also beneficial to maybe try and have a children’s table where they can all sit and play together. With their parents tables all being situated closely just in-case. Unfortunately, children are famous for their short attention spans. It may be a good idea to put together some goody bags, this is a great way of breaking up their day and allowing them to feel special. All in all, the Internet is a big scary knowledgeable place. And there are many blogs telling you what the right or wrong answer is. At the end of the day, the decision is entirely up to you and your partner. Some of your guests may be less than thrilled at the prospect of leaving their child for the night. But then again, some of them may look forward to a night where they can let their hair down. As selfish as it may sound, do what’s best for you and your fiancé. This is your special day which has cost you a lot of time and money. So don’t spend it being unhappy or worrying.